Product prices and availability are accurate as of 2019-04-19 00:39:33 EDT and are subject to change. Any price and availability information displayed on http://www.amazon.com/ at the time of purchase will apply to the purchase of this product. Office Depot Brand 50% recycled Envirocopy copy paper designed for those who prioritize "green" above everything else. 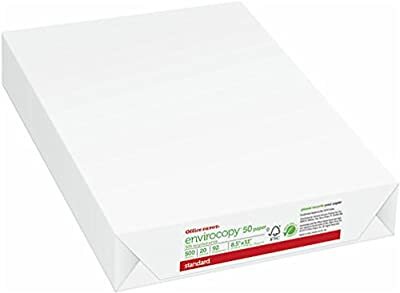 Paper is great for the environment and ideal for black and white copiers, fax machines and laser and inkjet printers and can be used everyday. 20 lbs density, FSC certified, acid free paper measuring 8 1/2"x 11" letter size is archive safe. Sold as single 500 sheet ream.